Finance Minister Arun Jaitley on Monday defended the Bharatiya Janata Party (BJP) and the government for discussing issues related to ‘national security and terrorism’ during the electoral debate. Hitting out at the opposition parties, Jaitley said that the issues concern to the sovereignty and security of the country hence must be discussed. “What is happening in the State of J&K and terrorism? Where does India stand on the issue of national security & terror? How such crucial issues are not real issues, for a stable India an early resolution of these issues is utmost. Thus the most important issue which, confronts India in the short, medium and even the long run, is how do we handle the State of Jammu & Kashmir and terrorism emanating from Pakistan and from within?,” he asked. Holding Congress responsible for the current state of unrest in Jammu and Kashmir, he said a ‘historical’ blunder by the party was responsible for the same. “The Congress Party is identified with the creation of the problem itself. When Pakistan did not reconcile to Kashmir being a part of India, the Congress Party whisked the issue away. It was its historical blunder on account of which we lost one-third of our territory,” he wrote in a blog titled ‘Why Jammu and Kashmir, and New Approach to Terrorism will Remain a Key Political Issue’. Emphasising that only the BJP can find a solution to the unresolved issues in Jammu and Kashmir, he said that the challenge needs a fresh approach of a leadership which is uncompromising on terror and in its determination to enforce law. “Terror supported from across the border can’t be fought either with velvet gloves or a policy of appeasement. The two regional parties have played a disappointing role. Of late, they are more strident in advocating secession of the State if firm measures are taken. The soft measures have not worked. The current leadership of the Opposition parties has hardly a roadmap except to tread on the path to disaster. This challenge can obviously be resolved with a fresh approach which is uncompromising on terror, uncompromising in its determination to enforce the rule of law and committed to total integration. A strong Government and a leader with clarity alone is capable of resolving the Kashmir issue. This will necessarily require reversal of the historical blunders of the past,” he wrote. 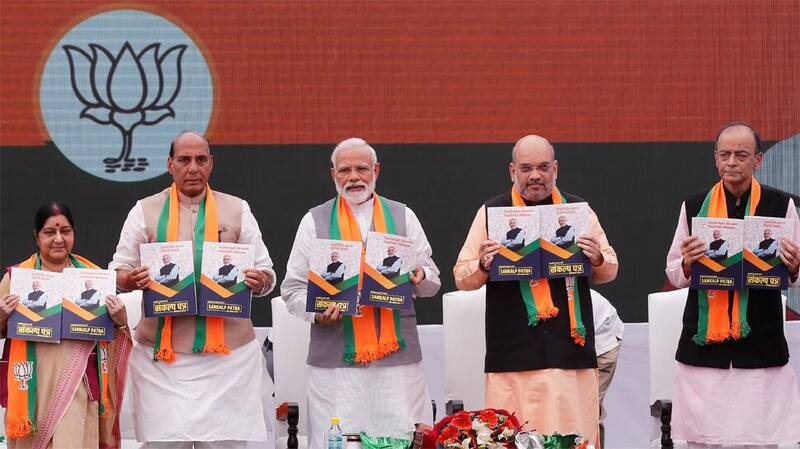 He added that the conventional election issues in India related to poverty alleviation, employment generation, improving growth rates, the quality of life of Indians, provision for quality healthcare and education, besides creating a world class infrastructure, and improving the quality of rural infrastructure. He added that there are also additional areas which related to the quality of leadership and probity in public life and preservation and strengthening of democratic institutions. However, he maintained that all these issues are all capable of resolution.